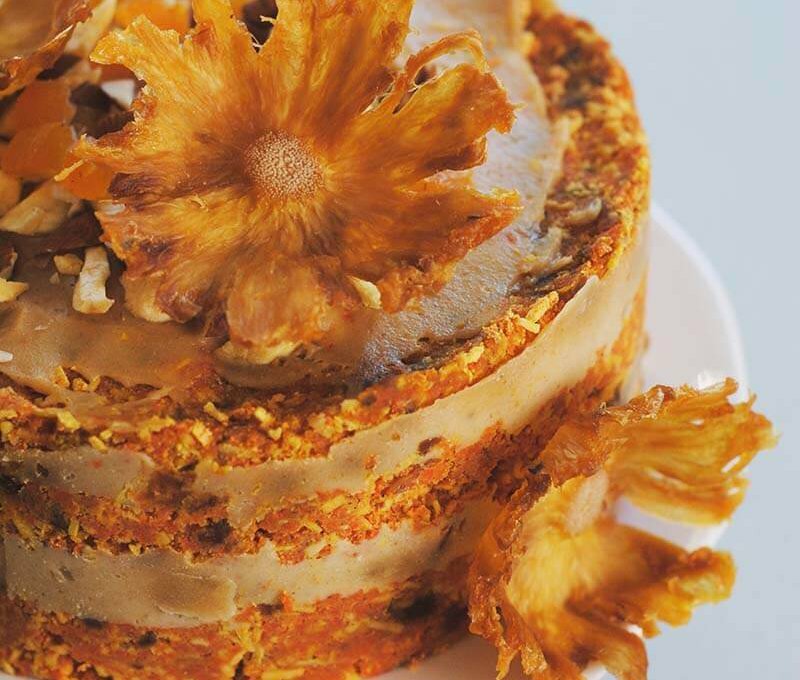 [vc_row][vc_column][vc_column_text]I originally posted this raw vegan carrot cake recipe in January of 2015. Since then, it’s become one of my most popular recipes. I hated the original photos, so I made the cake again and took new photos. You can view the original photos at the end of the post. This post includes some affiliate links. I love carrot cake but I would be mad at you if you served it to me on my birthday. It’s perfectly fine for an afternoon tea, but on my birthday I want chocolate. Don’t even get me started on ice cream cakes. I have opinions. The first time I made this cake, it looked a bit like a stack of veggie burger patties. It tasted amazing, but I knew I could do better. 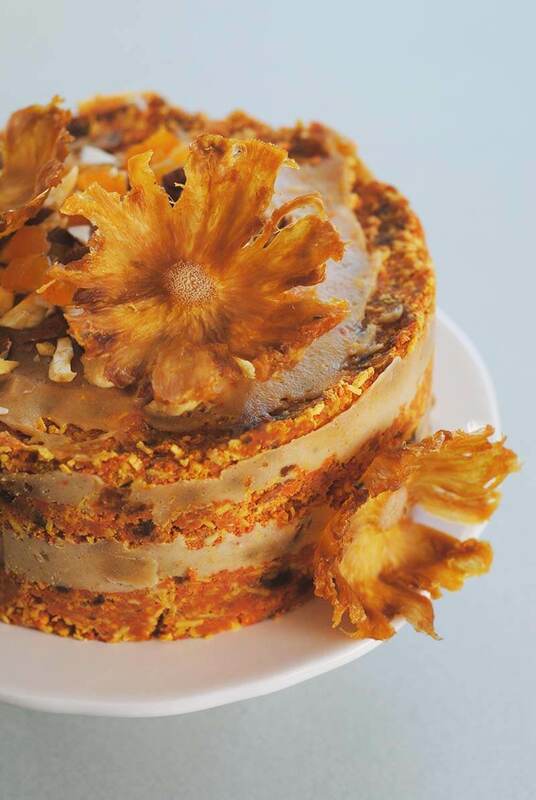 I decided to up my game a bit by making a larger cake and decorating it with dehydrated pineapple flowers. I made a video on how to make the flowers, if you want to get fancy. If you want to make a 6 inch cake, exactly like the one in the new photos. You should double the recipe. I took the mixture and pressed it into a 6-inch cake ring lined with acetate. That is how I got the sides to be smooth and even. The recipe can be pressed into just about any shape. Feel free to use a muffin tin, tart pan, ramekins, loaf pan…whatever you have around. I recommend making this cake 24 hours before you want to eat it. The taste and texture improve as it sits in the fridge. It really starts to feel like cake! Important note: To get super smooth frosting, make sure you soak your cashews for a few hours! 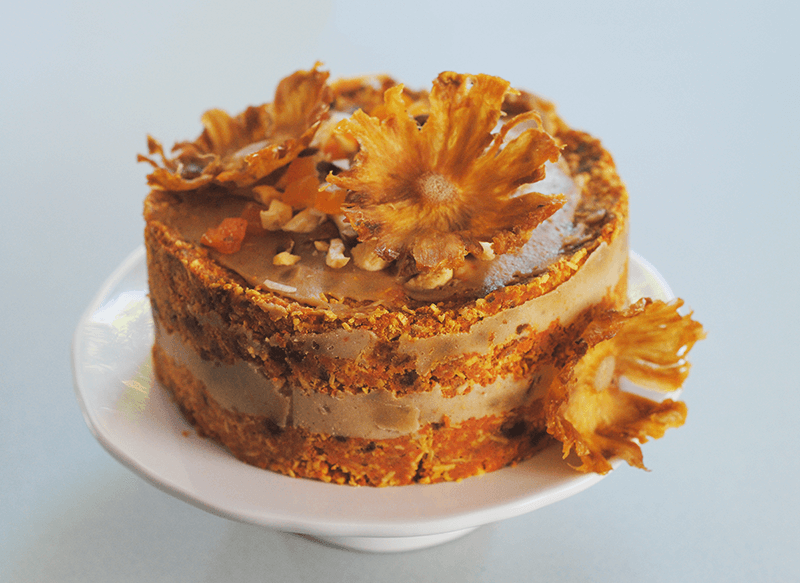 This raw vegan carrot cake is surprisingly filling. The recipe below will feed 8 people with cupcake size portions. Double the recipe for the 6-inch sized cake that is in the photographs. Squeeze as much liquid out of the carrots as you can. Combine the carrots, coconuts, dates, spices and coconut flour in a food processor and pulse until they come together. Try pressing some between your fingers to make sure it’s sticking. Prepare the pan of your choice by lining it with parchment paper. Press the mixture into the pan firmly and then place your cake into the freezer while you make the frosting. Put all the frosting ingredients into a high-powered blender or food processor. Mix until completely smooth. If it get’s warm while you are blending it, let it cool a bit before frosting your cake. Using an offset spatula or large spoon, spread the frosting over the top of the cake of cupcakes. If you are making a layer cake, be careful not to overfill or you might get some spillage out the sides. 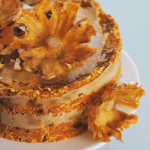 Top with coconut or nuts and dried fruit. Chill until ready to serve, best eaten 24 hours after making. The original Raw Vegan Carrot Cake images are below. I am whipping up a vegan dessert cookbook. Join my newsletter for release details! Hahah! I think this looks amazing! But it is just because I can imagine how incredible it tastes- I see what you mean by veggie burgers, but… my brain knows it isn’t! I really want to try this one! I love how it requires no dehydrator- I bartered mine for graphic design services a few years ago! >.< ! Anyway thank you for such a lovely and sure to be very yummy recipe! I had the leftovers of Shiho’s cake, it was delicious! We just finished this raw cake today and I have to say it tastes even better after a few days in the fridge. This looks awesome and I plan on making this dessert this weekend! Question. Do you have to use coconut flour or could I use what I have (which is pastry flour)? I would not use pastry flour, it will taste raw. I would use oat flour instead (put some oats through the blender). You might have to use a bit more because coconut flour absorbs moisture more than other flours. 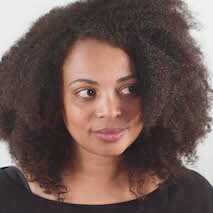 Hi Danielle, you could use almond flour or oat flour. You might need to add a bit more than recommended because coconut flour soaks up a lot of moisture. I would start by adding the amount in the recipe and then see if it’s holding together, if not…add some more a tablespoon at a time. I think these photographed beautifully! And I LOVE the way you’ve stacked them!!! I’m excited to try this! Thank you, Andrea! I can be hard on myself if the presentation doesn’t turn out exactly how I imagine it. I hope you make it and love it! I really love the look of your cake! Have you ever made it as one cake? I’d like to make it to take to a dinner party and thought it would travel better in a springform tin but it would be great to know if it would stay together in a larger piece. Thanks for any advice. Hi Coral, the shape is very flexible. I’m sure it would be great in a larger cake! Hi Seija, I can’t think of a replacement for the coconut but you could try making it without it. You might need a little extra oat flour to bind it together. Trail mix is just a mixture of nuts, seeds, raisins and other dried fruit. It is typically sold as a snack in bags or bulk. You can make your own if they don’t sell it locally. This looks incredible. I’d love to give it a shot, and I’m also wondering if it’s dense enough to make bars. What is the texture of the cake like? More on the soft side or the chewy side? Thanks! Beautiful photos! I would definitely say you could make bars out of it. It is very dense. If you press it down nice and firm, it will hold together. I tried this last night and it was very good! However, I had a bit of an issue with keeping it to stick together. It kept falling apart when I made the patties. Would you suggest adding some water to this to help? Hi there, sorry to here they didn’t hold together easily. I wouldn’t add water. I might add more dates because they are sticky! Do you think instead of the grated carrots, you could use the pulp from the juicer after making carrot juice? I’ve been looking for a recipe for that because I hate throwing it away! Thanks! I think so, you may need to play around with moisture levels a bit…but I think it should work! Excellent, I hope she loves it! Looks amazing! So glad I found this! I walked away (took a lot of willpower) from a luscious bakery case with a fresh baked carrot cake right in front of me. I have tasted theirs before.. and YUM. I thought.. will look for a RAW one! And HERE I found your pin on Pinterest! going to purchase the items I do not have on hand today and make this!!! This looks so good! Cannot wait to try it out! These were delicious! Thanks so much for a great recipe. I made them in my muffin pan, transforming them into mini cutie-cakes. That is great! I’m so glad to hear that. My wife and I tried this today and it was delicious. We adjusted the recipe a bit to only have 8 ingredients. Thanks Ben, I’m glad you liked it. I’m actually making it again today. Can you make this without dates? I don’t think so, they hold everything together.You could probably use apricots instead. Do you think there would be another alternative to using fruit such as dates or apricots? The person I would be making this cake for can’t have sugar and I know fruit is naturally high in sugars. If you know of anything else that could be used that would be great. Unfortunately, I can’t think of a low sugar option for someone who can’t eat the carbohydrates. I’m sorry! Hi, Do you think you can replace the cashews with walnuts or almonds for the frosting? The cashews have a higher fat content, so you get smoother texture. You would probably have to add some oil to the almonds or walnuts to make it work. Hi Jemima, the coconut is a pretty important part of this recipe but you could try using quick oats and oat flour instead. If you can’t use coconut oil in the frosting, you could replace it with some melted earth balance shortening. I haven’t tried these suggestions, but I think they might work. I made this cake about a month ago, was incredibly delicious. Took a while to make. I made one today for Easter dinner tomorrow and I’m sure it will be a hit! One thing I did differently this time is juiced my carrots so no grating and didn’t need to squeeze the juice out of my carrots. I added a little of the juice to moisten the mix a little. I also added goji berries to the mix. The juice from my carrots I will use in my mixed veggie juice today… no waste! That is a great idea! Thanks for sharing your experience with the recipe. I’m making this for a few vegan sugar free people at a wedding!! Is this correct as they are vaatly different and i don’t want to get this wrong!! Is there a good site for conversions you know of please? Hi Emma, grams are weight and cups are volume based so that is where you are running into confusion. Coconut is light and dates are heavy, so those numbers seem right to me. I’m Canadian, but I often use simplified measurements like this because I find my American readers aren’t really into weighing things.